With more than two decades of experience, Peter Mann is San Diego’s leading expert in the treatment of venous diseases. As a fellowship trained vascular surgeon, he is uniquely qualified to provide his patients with the most technologically advanced vein care available anywhere.Today’s varicose vein treatment options are simple, safe, minimally invasive and virtually pain-free. Best of all there’s no down-time and many of the procedures are covered by medical insurance plans. Done in the office in less than an hour patients can walk out and be symptom free almost immediately. Ambulatory phlebectomy is an advanced, minimally invasive procedure to remover large surface varicose veins. After local anesthesia, skin incisions or needle punctures as small as 1-2mm are made and the diseased veins are extracted in segments with a phlebectomy hook. No stitches are needed for these micro incisions. The procedure often is a more efficient way to treat surface veins than sclerotherapy, which may require multiple sessions or leave a large clot under the skin. A medical grade compression stocking should be worn for one week. Strenuous activity is avoided for two weeks. Bruising is expected, for 3-4 wks. Pain should be limited to mild aching. Veins removed this way never result in staining. The procedure is often done at the same time as endovenous laser closure or R.F. 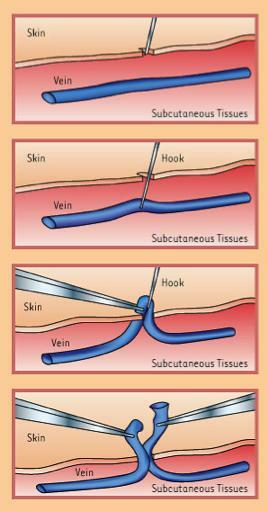 Closure of the saphenous vein.